This a two-part series from Fronteras Desk Correspondent Lorne Matalon. Click “continue reading” to find the radio story for part two. SAN MARCOS, Texas — Brooks County, Texas — 70 miles north of the U.S.- Mexico border — has seen at least 365 migrant deaths since 2011. Forensic anthropologists in Texas and Arizona are working to identify these migrants and repatriate their remains. 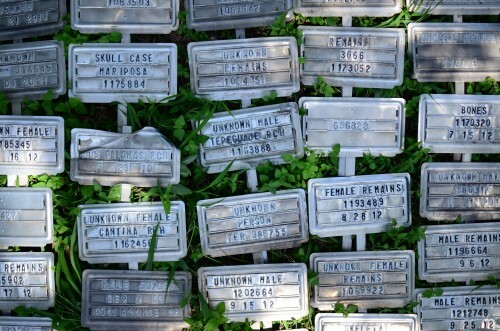 Behind an electronic gate accessed by a key card on a bucolic farm in central Texas, 100 cadavers donated for research by U.S. citizens lie on the ground in different stages of decomposition. 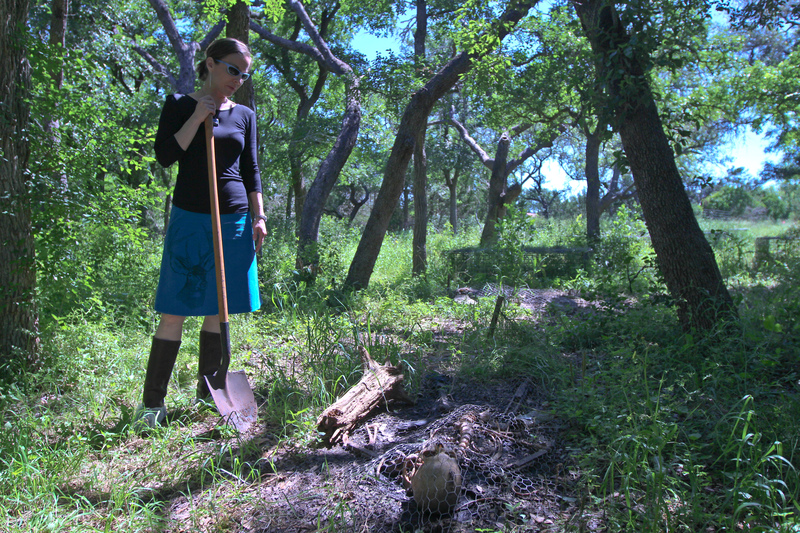 Forensic anthropologist Kate Spradley heads a relatively new project called Operation ID at Texas State University’s Forensic Anthropology Center. “When someone dies on U.S. soil, it is our responsibility to identify that person,” she said while walking in the shade where cadavers lay on the ground, protected by metal screens. Specifically, Spradley collects data on the rate of decay on these cadavers. It’s part of her research in determining a migrant’s time of death. “Most of the bodies disposed of in a clandestine manner in this part of Texas, it’s usually on the surface,” she noted. Brooks County is not on the border. But it does have a U.S. Border Patrol checkpoint at Falfurrias, Texas. Human smugglers drive migrants to just south of the checkpoint. Migrants then walk miles around it. It takes several days. Many die in merciless heat. It’s Spradley’s mission to identify them after their bodies are brought here. “Sometimes when I talk to people about what I do, they will tell me, ’Well why don’t you just send them back home.’ But we don’t know where home is. That’s what we’re trying to figure out.” she said. Spradley collaborates frequently with Hailey Duecker. She’s the forensic investigator at the Brooks County Sheriff’s Office. “One of the first things we ask people who report their loved one missing is when was the last time they had contact with them. When was the last time they knew the individual was alive,” she said. Duecker added that studying the rate of human decay on donated cadavers in different environments here – shade, sun, under trees or nestled in the grass – can help answer that question. Duecker says the cadaver research is an asset in both solving cold cases in ongoing criminal investigations and in identifying migrants. She explained how plant growth around cadavers provides clues for investigators. We were standing in front of a group of cadavers lying under protective metal screens. “If you notice (where the cadavers are placed) the vegetation is taller than the surrounding vegetation,” she pointed out. “So the volatile fatty acids initially when they decompose on the surface, they will oftentimes kill the vegetation. But whenever time it will enrich and you will get vegetation that’s even taller,” she said. Because Brooks County is not on the border, it gets no federal funding to identify dead migrants. The county foots the bill, amounting to hundreds of thousands of dollars per year. Bodies are found, personal effects and identifying features are catalogued, and then the bodies are buried. When funding allows, bodies are exhumed for possible identification. Right now investigators are waiting to analyze the remains of 123 unidentified migrants. Among Spradley’s tools to solve the mystery – who were these people – are vultures. “Texas has a huge vulture population because of the cattle industry,” she said. And so some of the donated cadavers are deliberately exposed outside – unprotected – the way migrants are found. And Spradley says understanding how vultures devour a body has changed the way a newly discovered skeleton is analyzed. “We’ve noticed kind of what we call taphonomic signatures, broken ribs, the pecking out of some of the small, delicate bones in the eye orbit,” she said. For help in identifications, Spradley collaborates with colleagues in Arizona. The Colibri Center is in Tucson, in Pima County. Its investigators are embedded in the Pima County Office of the Medical Examiner. “To contrast Arizona and Texas, in Arizona, the Pima County Office of the Medical Examiner serves the entire (Arizona) border. So a body is found, it’s brought to a medical examiner’s office. And it gets a full chance at identification,” Spradley explained. “In Texas, there are so many counties along the border and so few medical examiners that not everybody makes it to a medical examiner’s office. Right now we’re trying to figure out how many people die along the Texas border. “We have no idea because there’s no centralized reporting system,” Spradely said. And that means, in Texas, a full accounting of the number of people who die each year attempting to enter the U.S. from Mexico and beyond is next to impossible to compile. “I was contacted by a colleague at the Colibri Center for Human Rights in Tucson,” she said. The Center’s investigators work in the office of the Pima County Medical Examiner in Tucson. Colibri accepts Missing Persons reports on lost migrants that U.S. law enforcement routinely won’t. The Colibri Center was calling Spradley about a 20-year-old El Salvadoran named Oscar. “Oscar was traveling with a friend,” Spradley said as she recalled the scenario that ultimately led to a rare success. His family knew that because the friend called Oscar’s relatives in Houston. He told the family Oscar had succumbed to the elements. “Just exhaustion, probably heat exhaustion and he also hurt his leg,” said Spradley. Before he was abandoned, the companion noticed Oscar was limping. “And so the companion, he was wearing a brown plaid shirt and took it off and wrapped it around Oscar’s leg to help him walk,” Spradley continued. After that, Oscar was buried in an unmarked pauper’s grave. The family wanted to find him, but couldn’t even start the search. “Nobody remembered where Oscar was buried,” recalled Spradley. A break in came Spradley’s way in May 2013, the year after Oscar died. 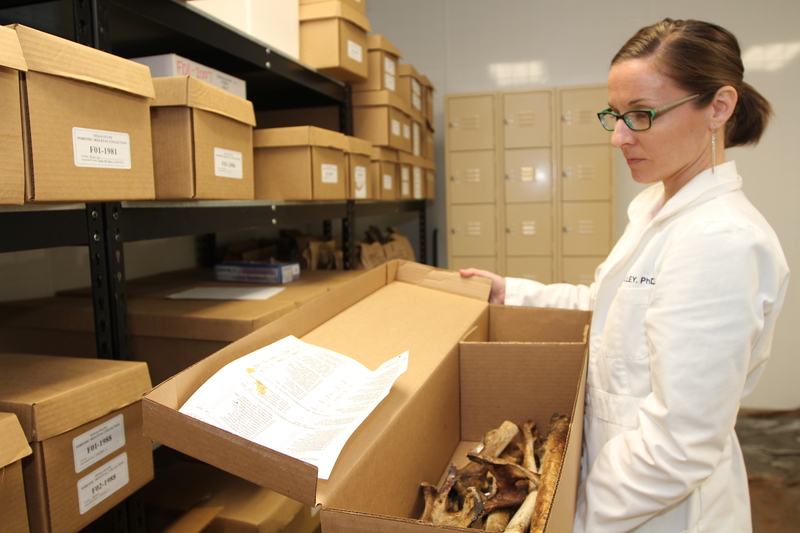 Hailey Duecker, the Brooks County Sheriff’s forensic investigator picks up the story – when university anthropologists joined with forensic investigators launched a project to identify long-buried migrants. “They went into the cemetery to exhume a lot of these unidentified remains. So they could have a proper attempt at identification, mainly skeletal analysis, DNA sampling, proper inventorying of photographs of their personal effects,” said Duecker. Investigators recovered the bodies of 100 migrants. They didn’t know it but one was Oscar’s. His body was brought to Kate Spradley’s lab. There it had been cleaned down to the skeleton so a DNA analysis could be made. Then, says Spradley, the story turned again. “I was looking at Missing Persons reports one day and I came across Oscar’s Missing Person report,” she recalled. That jogged her memory. Her students had just cleaned a brown plaid shirt wrapped around the knee of an unknown man. 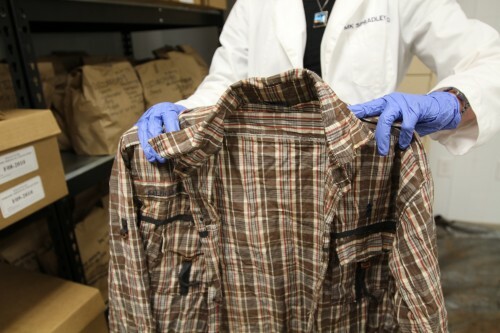 The shirt’s discovery kicked off a chain of events that led to a DNA match. His family’s DNA was taken by an Argentine forensic team in El Salvador, then brought to the U.S. And a DNA sample from the skeleton matched DNA from Oscar’s family. Oscar’s story is a rarity. “There’s multiple obstacles because right now, family references samples must be collected by U.S. law enforcement,” Spradley said. And even if a migrant has family in the U.S., there’s often another challenge. Oscar’s relatives told investigators they’re grateful for the bittersweet knowledge of knowing with certainty what happened to him. It is knowledge that many families never receive. This entry was posted in KRTS News and tagged Border, Border Patrol, Border Security, falfurrias, Immigration, Mexico, texas state, texas state forensic anthropology center, us border patrol. Bookmark the permalink.